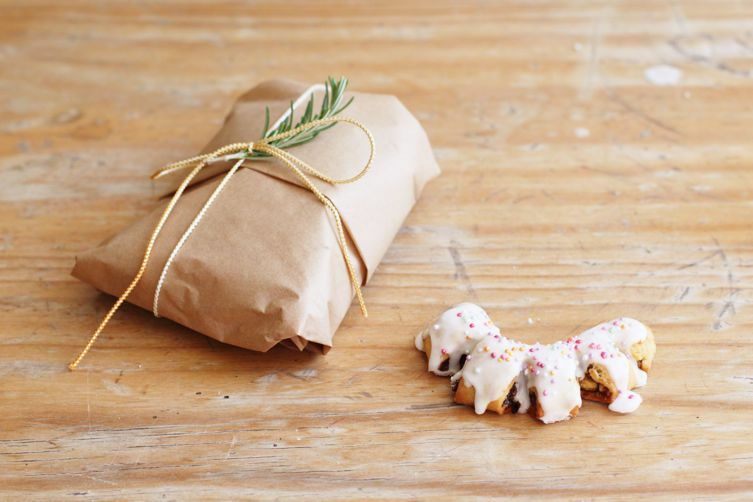 Are These Christmas Cookies the Fig Newton's Ancestor? This is one of those recipes that changes in form and flavor with the whims of the hands that make it. 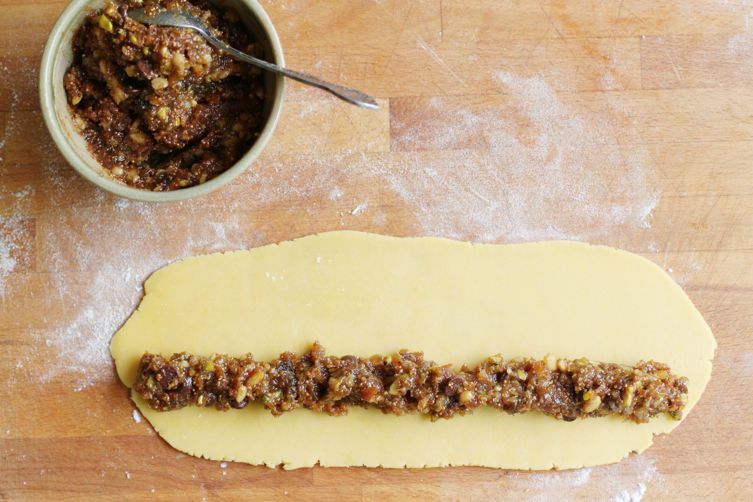 It's a recipe that's made with several generations in the kitchen at once, mixing, rolling, and shaping together. It's also a recipe associated entirely with Christmas—and like other recipes that fall under that category, the first bite or whiff of the cookies' aroma is sure to bring on waves of nostalgia. 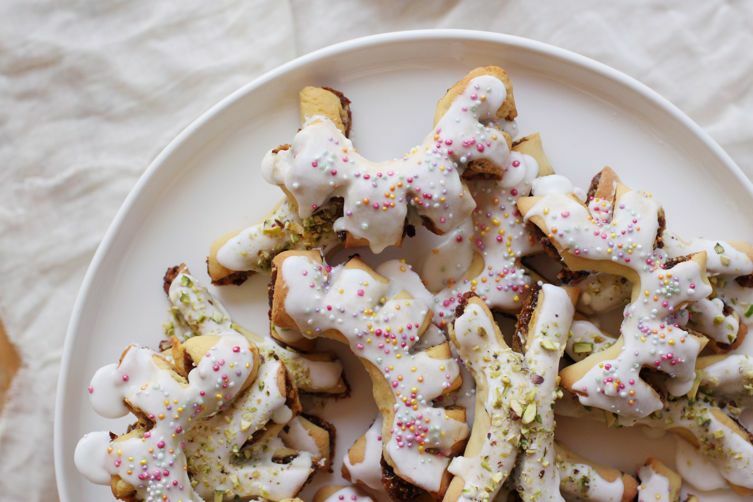 Known as cucciddati or cucidati in the Sicilian dialect, buccellati are Sicily's best-known Christmas cookie. A thin pastry wrapped around a filling of dried figs and nuts, they are reminiscent of fig cookies, but better—and prettier. Often made into baroque forms, then glazed with royal icing and decorated with colored sprinkles or simply dusted with confectioners' sugar, these festive treats don't stick around for long. Make the most of them by baking a big batch and sharing the love with family and friends. There are as many variations of these cookies as there are households in Sicily. You can find them in the form of one large buccellato ring, its pastry heavily decorated with intricate crimping; or as individual buccellati cookies in a variety of shapes and forms. 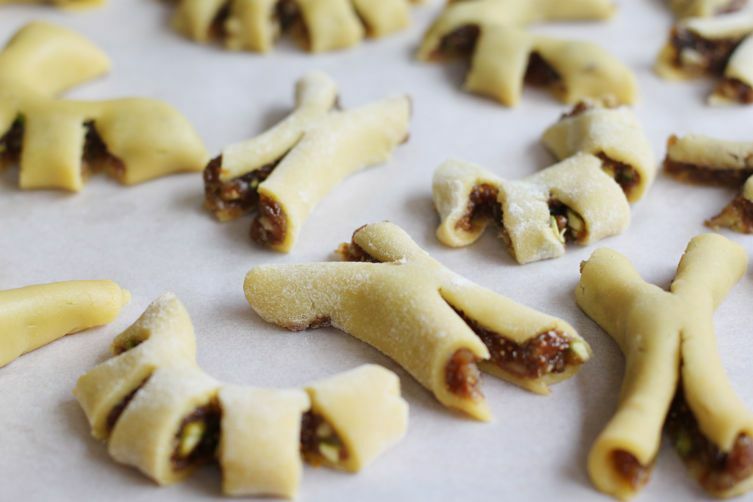 The "X" shape and the arch are common forms, but you can also find them made like half-moon ravioli or, even simpler, in little logs like cannoli, as well as shorter, flattened versions (the predecessor to the Fig Newton, perhaps?). It is common to cut slashes or patterns into the pastry with a razor blade or very sharp knife to expose the contrasting filling for decoration, as I have done here. Once you've decided on the form you want, consider some of the following common variations in the filling. Instead of orange marmalade, try apricot or peach jam—or cut a step out by using fig jam instead of the dried, soaked, and chopped figs. Substitute the pistachios or pine nuts for almonds or hazelnuts. Change up the orange zest with other citrus—mandarin or lemon for example. Add 100 grams of dark chocolate chips, candied citrus, or dates. Use a splash of marsala or rum, or add some of your favorite Christmas spices (ground cloves or nutmeg are commonly used). 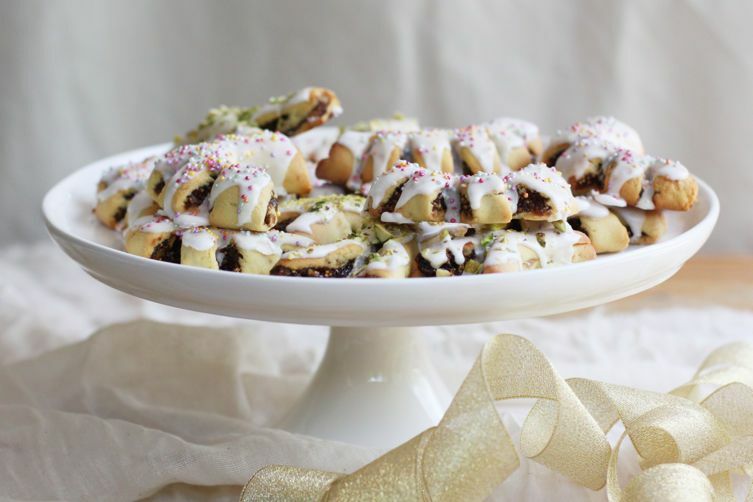 Decorate with a royal icing glaze topped with chopped pistachios or candied fruit instead of colored sprinkles. Or keep things simple with a dusting of confectioners' sugar. And if you want to go really traditional, substitute lard for the butter for a wonderfully flaky pastry, and add some citrus zest for added aroma, too. More: Make your cookies merry and bright with a dusting of artisan sprinkles. This amount makes enough buccellati for your own Christmas table, as well as plenty for festive handmade gifts. This is such a decorative cookie with so many variations, so it's quite nice to experiment with the forms, patterns, and decorations in one batch—why not? Oh Emiko, I am so glad you shared this recipe! All my Italian friends guard their versions like they're the Hope Diamond. And I LOVE them. Another one I need to make. Sicilian dolci are fascinating; these are clearly another one with an old Arabic influence, which, as you say, may have then carried over into fig rolls (as we call them in the UK). My Sicilian family has been making these for decades and depending on which side of the family you're talking to they are called slightly different names. My mother's side calls them biccidati and my father's side calls them cuccidati. However, I have never heard them called buccellati and am curious where you got that name from. Thanks for your reply. Thanks for the info. :) I love learning about Sicily, especially the customs and all the wonderful food. My families are from Valguarnera Caropepe and Villarosa in Enna. Very good recipe! Congratulations! I am Sicilian living in Caracas, Venezuela and I use to prepare cuccidati every year. All my friend are waiting for my Christmas gift: a box with a dozen of buccellati. I would like to bring you my little secret in the filling: I add dark chocolate chips, mandarine zest and ground almonds (lightly toasted) Thank you for the honor remembering my land and sorry for my poor English. What are walnut kernels and where can I find them? Thank you. Can I freeze these? I would love to spend a day making a few batches soon so closer to the holiday I have free time for visiting and entertaining. I'm very allergic to pistachios. Can I substitute almonds? Absolutely - some other ideas for substitutions are noted in the article above! I absolutely love fig newtons and these are lovely. Is the dough soft or more like a sugar cookie in texture? The dough is much like a sweet shortcrust pastry which is why it's easiest to work with it when it is chilled as it gets very soft while working with it! When cooked it's soft and short like pastry. Thank you! This brings back such happy memories from growing up. My mom made these every year at Christmas for my Nonno. So happy that this jogged such a nice memory! I'm so happy to see this - Now I don't need my friend's husband's secret recipe any longer! Thanks! Ha, that's great! Every recipe is probably a little different but now you can make it all your own! Thanks, hope you give these a try! Yes!! I have been looking for this recipe for years. Thank you! !